Formed by melting ice glaciers at the end of the latest Ice Age, Lake Huron's surface covers over 23,000 square miles. Because it was the first of the Great Lakes to be explored by the French, they called it La Mer Douce, meaning fresh-water sea. 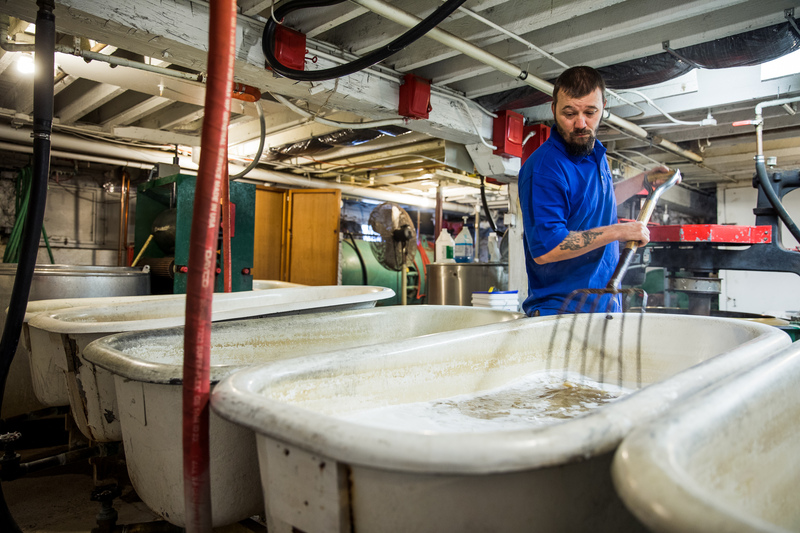 This fresh water is the main ingredient in the second step in our process for making our wool bedding: cleaning the wool. Our Climate Beneficial wool arrives "right off the hoof." Basically this means that is freshly shorn and covered in hay, chaff, burrs, seeds, etc. It needs to be transformed into the pristine, white, fluffy wool that is the filling of our wool bedding. This is where our "Great" water supply comes in, Lake Huron. We fill antique, cast iron bathtubs with piping hot, 180 degree Great Lake water and add organic, unscented, biodegradable soap. The wool is then added to this chemical free bath and swished by hand with a pitch fork. This process lasts about an hour with the goal of removing all the debris and most all of the natural lanolin. Removing the lanolin, a common source of allergic reaction, rids the wool of the barnyard smell that is a common wool bedding complaint. After the wool is washed it needs a thorough rinse. To rinse, the wool is taken out of the bathtubs and placed in our circa 1890's extractor and hosed down again with 180 degree Lake Huron water. After it has a good dousing, the extractor is turned on and it spins much like the spin cycle on a washing machine. It whirs like a top, and while its whirring, the wool is hit one last time with hot water. And.....finally, it is clean. Thanks to water and equipment that has been around for centuries, the wool is now ready for the drying process.